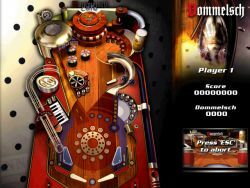 A simplified version of pinball featuring Sonic the hedgehog as the ball itself. 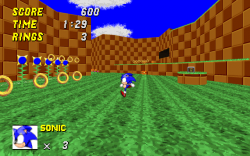 In this version of a computerised pinball machine, Sonic the hedgehog is a ball in a giant machine and advances through four different zones… for a reason which isn’t specified. The pinball machine in which Sonic mysteriously inhabits is a sparse and largely desolate place. 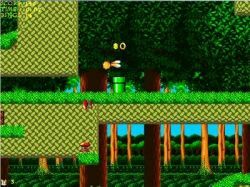 Springs and poles are situated at seemingly random intervals throughout the levels which Sonic bounces off in order to collect tokens featuring his own image. In between the levels are pointlessly huge and needlessly complex boss battles which rely wholly on chance to complete. The one thing which has to be mentioned is the floor of each level is such a disgusting choice of colours that it induces headaches and nausea as it becomes blurred through speed. This game is pretty much a blueprint for bad design choices in games. Play it only if you need to know what not to do when making your own game.